A portable golf game starring Mario and friends. Released with the Mobile GB adapter, you can connect to other versions of the game through a mobile phone network to challenge other players. Based on Mario Golf, you control several golfing hopefuls as they play through a series of courses against computer or human opponents in order to win. You can play as Mario characters in multiplayer and minigame modes. 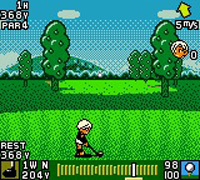 Mobile Golf was the final Game Boy Color game released by Nintendo in Japan.